We’ve come a long way from the days of hot-applied coal tar and asphalt. The commercial roofing industry has become highly technical, both in the way materials are designed and installed, as well as how roofs are maintained to extend their useful life. 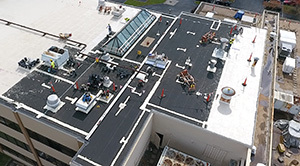 Today there’s a true scientific approach to commercial roofing that involves innovative software and sophisticated testing, as well as a considerable amount of research, data analysis and predictive modeling. Facility managers/owners who are buying into these modern best practices are likely to realize significant savings in life-cycle costs and budget dollars.